• New salt targets must be set, as further reductions would have major health benefits. Research from the Wolfson Institute, Barts and London, Queen Mary University on the salt levels of bread over the last 10 years has shown that salt levels have come down by an average of 20%. The surveys, conducted by Consensus Action on Salt and Health (CASH) looked at salt reductions made over time in packaged bread sold in the UK. Approximately 75% of the salt consumed in the UK and other developed countries come from processed foods, and bread is the single largest contributor of salt in the diet (one fifth), because bread is such a large part of the UK diet [Ref 1]. The results show that bakers have gradually reduced the levels of salt in their products, and should be congratulated, with approximately 2,400 strokes and heart attack events prevented each year, but much bigger reductions can be made. However, a wide variation in salt levels was found, with many products now below the Department of Health 2012 targets, indicating that further reductions can be made. Branded products are lagging behind; in 2011, just under 90% of supermarkets had met or were below the 2012 targets, compared to under 50% of branded products. The Department of Health are currently in the process of setting new targets for all of the products that are major contributors of salt in the diet, including bread. By reducing the average salt content of bread by a further 10% to 0.9g/100g (a figure which 27% of products already met in 2011) we could make a further reduction in population salt intake of 0.11g/person/day, resulting in approximately 1,200 fewer heart attacks and strokes every year. By reducing the salt content further still to 0.8g/100g (a figure which 11% already met) the reductions to population salt intake would be approximately 0.22g/person/day, resulting in approximately 2,400 fewer heart attacks and strokes every year. This is just from a reduction in the salt content of bread to levels that are already available in the supermarket own brands. “A reduction in population salt intake is one of the most cost-effective measures to improve public health, as lowering salt intake lowers blood pressure and reduces the number of people suffering and dying from stokes heart attacks and heart failure” says Professor Graham MacGregor, CASH Chairman and Professor of Cardiovascular Medicine at the Wolfson Institute. “Bread is the single biggest contributor of salt to the UK diet and it is vital that we set challenging targets for the bread industry in order to save the maximum number of lives”. Bread is also a major source of salt in the diet in many other countries and the success of the UK bakers in reducing salt shows that it can be done in other countries. This is vital as at the World Health Assembly in May 2013 it was unanimously agreed that all countries should reduce their daily salt intake by 30% towards a target of 5g per day, by 2025. Chris Young, Co-ordinator of The Real Bread Campaign, "This report gives shoppers yet another reminder that not all loaves are created equal. There is no excuse for any industrial loaf manufacturer still to be using more salt than the FSA’s target maximum amount, and the Real Bread Campaign urges all remaining salty bakers to cut their levels now! We encourage shoppers to choose Real Bread, crafted locally by a baker who uses less salt and no artificial additives or hidden processing aids, or to bake their own." Figure 1. 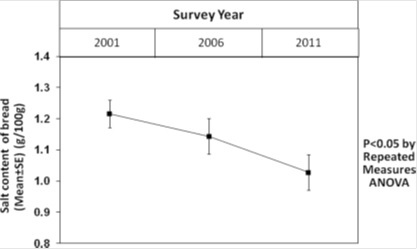 Salt content in bread in repeated surveys, 2001–2011. Ref 1 - Bread contributes 18% average daily sodium intakes, by food sub-category, for adults aged 19-64. NB This is due to the large quantities of bread eaten every day in the UK diet. We recognise that bread has an important role to play in a healthy, balanced diet.